The scholar Jean Devise has traced the earliest uses of a Moor or a Black figure in heraldry to Bavaria, the upper Rhineland, and Lower Saxony in the late thirteenth and early fourteenth centuries. The use in family and institutional crests at this time, as illustrated in the examples below, most likely reflected the spread of the imagery of the Hohenstaufen emperors, as in St. Maurice and the Black Magus, in which Black figures stood in for the universalist pretensions of the Church and the Empire. A Black woman holding a lily, symbol of the Holy Trinity, has adorned the crest of the Kirchberg family at least since 1263. Zürcher Wappenrolle (ca. 1335-1345), Zürich, Schweizerisches Nationalmuseum, AG 2760. A crowned Moor has featured in the crest of the Archbishopric of Freising since at least 1284, perhaps because of a Kirchberg family connection, a connection to the Crusades, or simply an illustrator’s mistake. Zürcher Wappenrolle (ca. 1335-1345), Zürich, Schweizerisches Nationalmuseum, AG 2760. 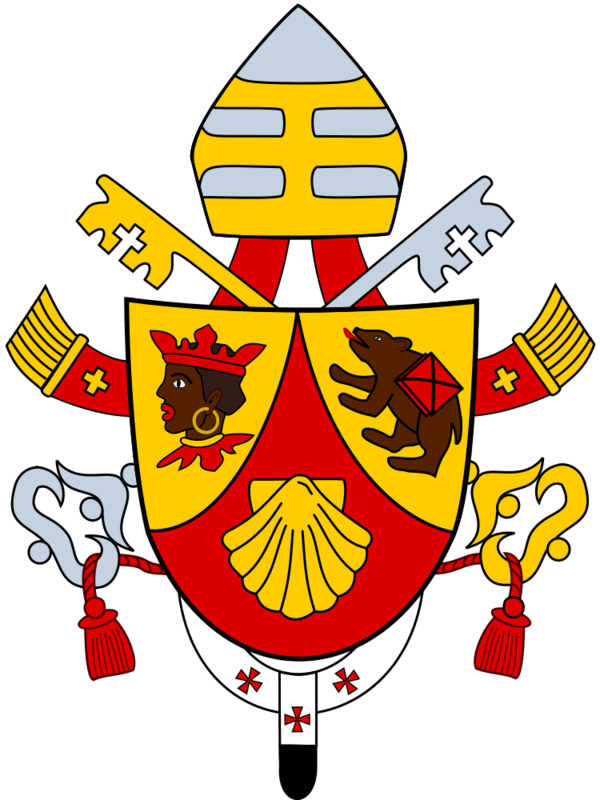 The coat of arms of Pope Benedict XVI (2005-2013) includes the crowned moor from his home archbishopric, Freising. Piotr Michał Jaworski, “Coat of Arms of Pope Benedict XVI” (2005), Wikimedia Commons. 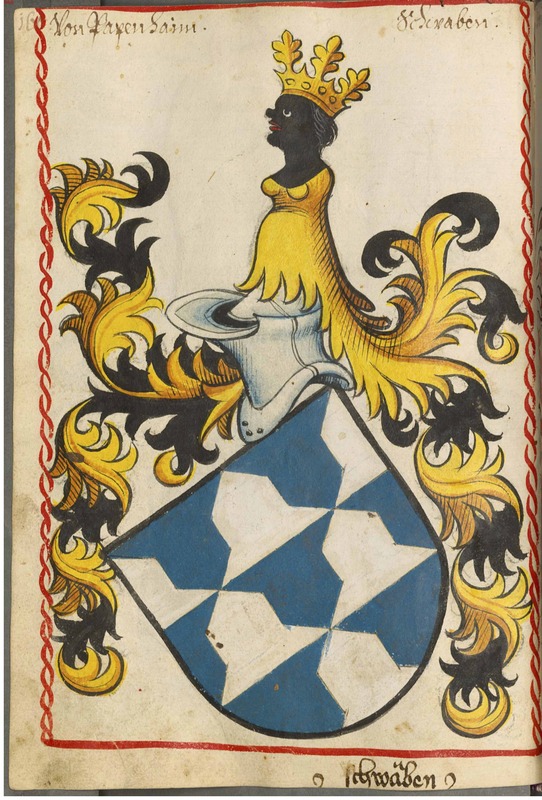 The crest of the Pappenheim family (and the city that bears their name), first featured a Black king in the fourteenth century, but that figure morphed into a Black queen for reasons that remain unclear. Scheibler’sches Wappenbuch (South Germany, ca. 1450-1580), Bayerische Staatsbibliothek Cod.icon.312c. 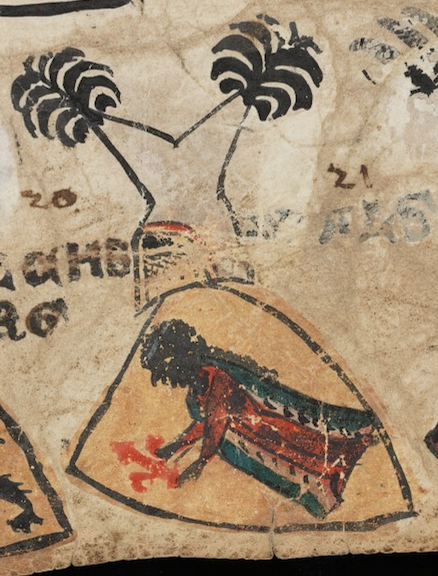 Crowned Moors on crests (ca. 1263-1400) by Jeff Bowersox is licensed under a Creative Commons Attribution-ShareAlike 4.0 International License.